“Institut Louis Bachelier” is the front office of the Louis Bachelier Group. The role of the “Institut Louis Bachelier” is to serve, promote and facilitate the Louis Bachelier Network. Around 15 people are dedicated to the support of activities and interaction within four main transition-areas that affect our global society: Finance, Demography, Climate and Digitalization. ILB currently runs 51 research programs under these themes and labels research programs as Lab of Excellence in the area of “Finance and sustainable growth”. By creating links between academic experts, economic actors and public authorities, the Institut Louis Bachelier participates in the creation of research programmes. Through its two Foundations, it manages chairs, research initiatives and finalised research programmes, involving more than 400 researchers. The Institut Louis Bachelier is a meeting and networking platform intended to foster interaction between the research community and economic actors. It regularly brings together leading academics and eminent members of the banking, finance, insurance and asset management industry to discuss issues of crucial importance. Some hundred events are organized every year. The Institute also provides workspace for researchers on its premises, located in the Palais Brongniart. Every year the Institut Louis Bachelier organizes the Financial Risks International Forum. This event presents the best research in the field of financial risks. More than 500 people attend this two-day event at the Paris Chamber of Commerce and Industry, at which over 60 papers are presented. 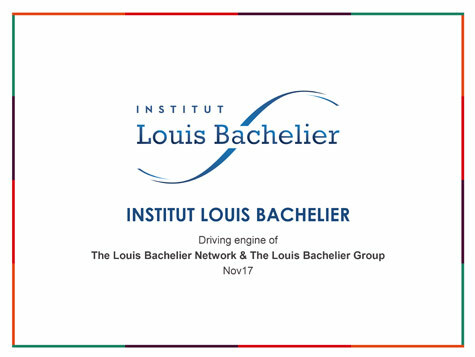 Through its publications (Les Cahiers Louis Bachelier and Opinions & Débats), the Institut Louis Bachelier disseminates the work and findings of its research programmes, in particular to companies and regulators. The Institute’s website Louisbachelier.org presents topical research in economics and finance through news reports, video interviews with researchers, and the programmes of scientific events.